Smooth and soft fresh brie. 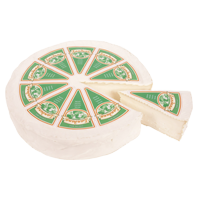 Landana Chèvre Brie NATURAL is a mild goat cheese made from 100% Dutch goat’s milk. The traditional ripening for 8 to 10 days ensures an attractive natural white rind around the cheese which gives the Chèvre Brie its own special flavor. Landana Chèvre Brie NATURAL is gluten free by nature.